The DW Stadium formerly known as the JJB Stadium between 1999 and 2009 is a multi-purpose sports venue located in the northern town of Wigan, Greater Manchester. Home to Wigan Athletic Football team, the 25,133 capacity ground is also leased by Wigan Warriors Rugby Club. Since Wigan Athletic first moved into the JJB Stadium at the start of the 1999-2000 season, the club’s fortunes have improved dramatically. Starting out in the third tier of English football, The Latics earned two promotions to reach the Premier League for the first time in the club’s history during the 2005/2006 season. In the club’s opening season at their new stadium Wigan reached the League Cup Final hosted at Cardiff’s Millennium Stadium. Although The Latics lost 4 nil to a rampant Manchester United, they would later go on to claim revenge against the blue half of Manchester, defeating Man City in the 2013 FA Cup final. Completely against the odds, many regarded it as the biggest “Cupset” since Wimbledon defeated Liverpool at Old Wembley in 1998. Previously, the club had played at Springfield Park for the past 67 seasons however after the publication of the Taylor Report in 1990 the old ground lacked a future in the modern game. At first renovation was considered, followed by a bold proposal which would see Wigan share Bolton’s Reebok Stadium, before the club realised that a new stadium was the best option. Spearheaded by Dave Whelan’s take over at the club in February 1995, the new stadium was to be located out of town on the Robin Park Complex at a cost of £30 million. Designed by Alfred McAlpine who had just successfully designed Huddersfield’s John Smith’s Stadium, the ground consisted of four single-tiered stands which were unconnected and covered by a curvy cantilevered roof design. Construction began early in 1999 and was completed eight months later in August, just time for the start of the season. Originally known as JJB stadium, the ground was renamed to DW Stadium after Chairman Dave Wheelan took over the sports ailing sports firm in 2009. Since opening it has also been the home of Wigan Warriors Rugby League who rent the ground. 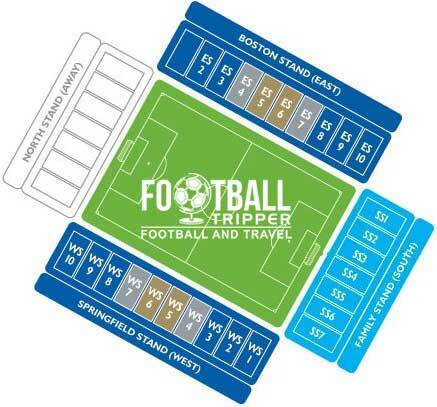 Wigan’s ground is comprised of the following four sections: North, The Boston Stand (East), South and The Springfield Main Stand (West). 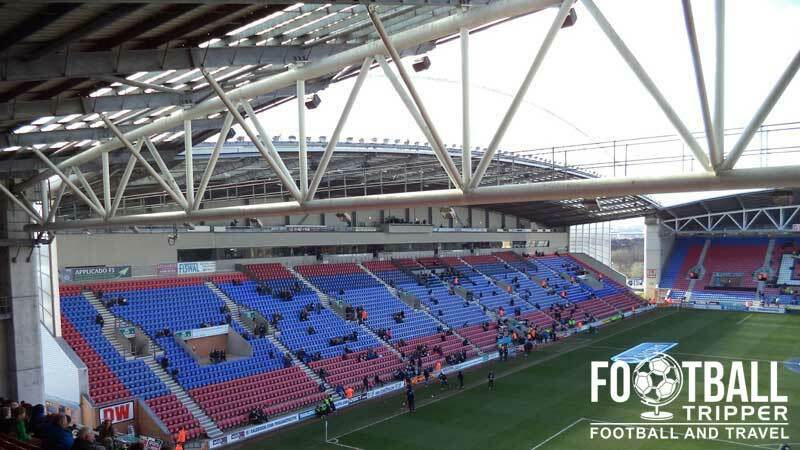 Away supporters who make the trip to Wigan’s Stadium will be pleased to know that they are allocated the entirety of the north stand which has enough seats for around 5,500 spectators. However, no more than 4,800 tickets are ever issued per football match as the concourse reportedly becomes over-crowded during half-time, causing great irritation to fans. Whether it was a technical oversight by the constructors of the stadium or if the club simple wanted to create a more comfortable matchday experience remains to be seen, with other aspects of the ground such a levels of leg room, distance from pitch and comfort of seat more than adequate for a European-level sports venue. With an undeserved reputation for being more of a Rugby town despite Football matches attracting higher average attendances, Wigan Athletic fans often endeavour to prove this isn’t the case by creating a lively atmosphere on matchdays. This was particularly evident when the club competed in the Premier League, although attendances and noise levels have declined somewhat since relegation as to be expected. The DW Stadium recognises the fact that it is out of town and as a result the owners have created spacious drinking areas for both sets of fans around the ground. There is even a specific one for away fans located next to their turnstile in the north stand, and sells a variety of food and drink ranging from tea, pints, to sausage rolls. Otherwise The Red Robin Fayre and Square owned pub is the de facto watering hole of choice for supporters, although not necessarily away fans, as its policy on admittance is slightly ambiguous and can depend on who Wigan are playing. Back towards Wigan’s town centre there is of course a vast array of pubs to choose from around both railway station including the likes of The Berkeley Cask Ale House, The CAMRA listed Anvil Pub and a Wetherspoons – Moon Under Water. Just south of the DW Stadium is a modest sized retail park which contains such dining options as Frankie & Benny’s, Burger King and even an Asda Supermarket. Back towards the more commercialised area of Wigan there is naturally more choice, although food at the stadium should also never be written off. The Latics operate two club shops within the town of Wigan, in addition to their Online Store, The Latics Shop which allows fans to browse, buy and inspect merchandise 24 hours a day, 7 days a week. Located within the Grand Arcade Shopping Centre sharing a premises with the DW Sports Store, this is a good option for those unable to get to the stadium before kick-off. Entering not advised for anyone who’s Latic intolerant. Located next to the Players’ Lounge this store is open up to 3 hours before kick-off on match days, although this can vary depending on whether the fixture is a midweek or weekend game. 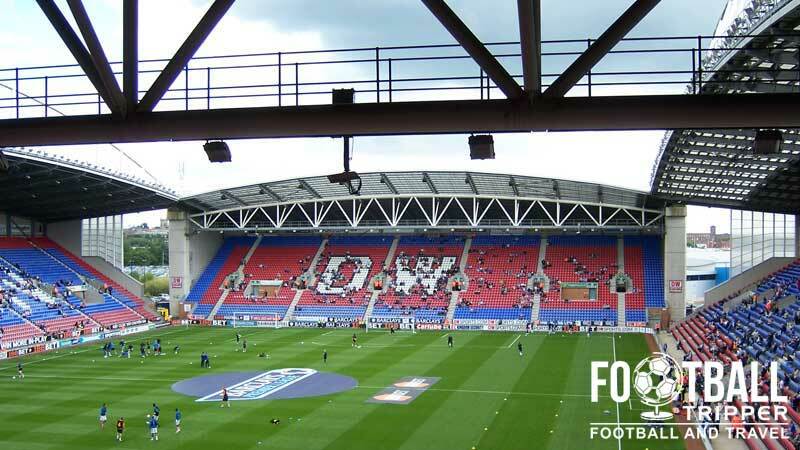 It doesn’t look as if Wigan Athletic offer football fans the chance to tour of the DW Stadium. Sorry. 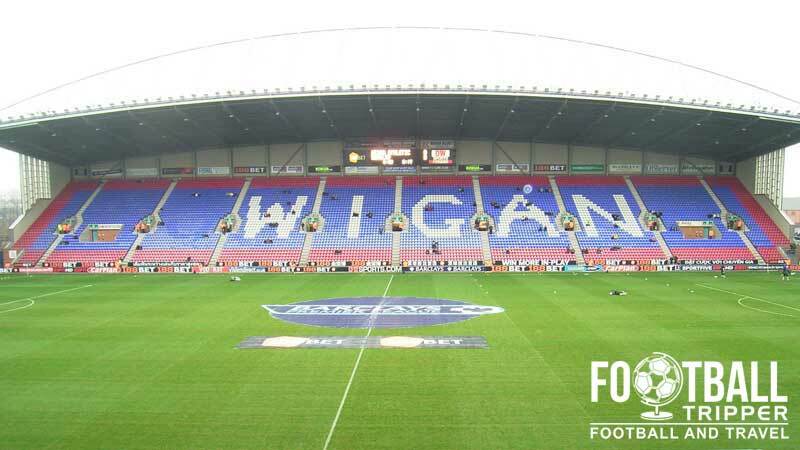 To purchase tickets to see Wigan Athletic at home you can either visit the ticket office at the DW stadium, phone the ticket hotline or visit the club’s official online box-office which is powered by Ticketmaster. Most clubs tend to encourage their fans to book in advance in order to benefit both parties financially, and The Latics are no different although their ticket office on matchdays is open for up to five hours before kick-off for weekend matches. *Free of charge when accompanied by a full paying adult and registered with Team Latics. 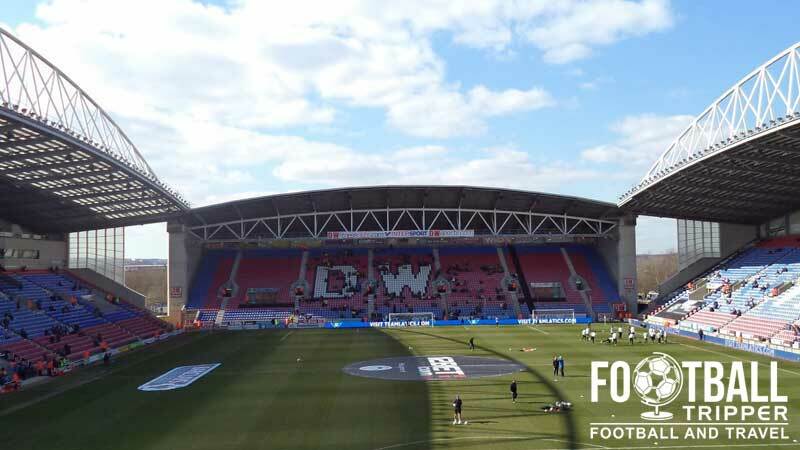 Located around 1 mile away from Wigan town centre, the DW Stadium is located next door to Robin Park Arena and technically falls under the metropolitan area of Greater Manchester. The “DW Stadium” sign above the main entrance to the main stand. The town of Wigan is served by two train stations which are both no more than 1.3 miles east of Wigan Athletic’s stadium. Located pretty much opposite each other, Wigan Wallgate is primarily used for regional rail services to the likes of Manchester and Liverpool with Wigan North Western serving more national routes on the West Coast main line. Outside both stations you can catch a taxi for around a fiver to the ground with both walking routes pretty much identical. Turn right on stadium way and follow this until you arrive at the stadium. There are numerous bus stops located on Scot lane and Robin Park road but we currently don’t have any further information about which the best services are. Loire Drive, Robin Park, Wigan, WN5 0UH. Wigan fans celebrating remarkably winning the FA Cup, and impending relegation. The DW Stadium is blessed with approximately 2000 parking spaces located around the stadium with Car Parks 1 (Visitors Car Park), Car Park 3 (East Stand) and Car Park 4 (Frith street off Saddle Junction) open to the general public on matchdays. Please note: Car parks 2 and 5 are reserved for use of the club and its guests, with parking at the nearby Robin Retail Park not advisable due to the being short stay only. Not to mention the risk of getting a parking ticket. There aren’t any hotels within the immediate vicinity of the DW Stadium but if you have a car and are driving to the stadium the Premier Inn located on the M58 near to junction 26 from the A577 might be a decent shout. Otherwise your options are limited to the hotels within the town centre with the Swan and the Railway, and The Bellingham Hotel seemingly being the pick of a very limited bunch.